UNCG police hand out hamburgers to students at the first annual Spring Community Cookout. 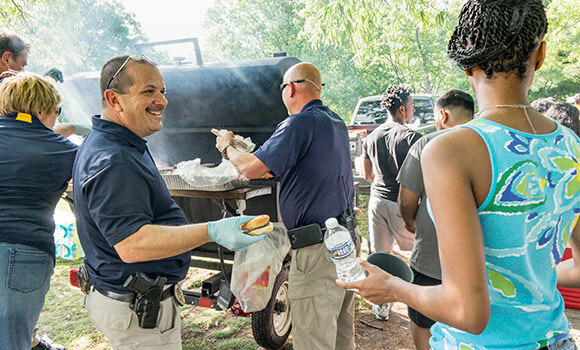 Approximately 350 UNCG students and 34 UNCG police officers gathered together on Friday, April 28, to enjoy food and fun at the first annual Spring Community Cookout. Sponsored by the UNCG Police Department, Campus Activities and Programs (CAP), Student Government Association (SGA) and the Residence Hall Association (RHA), the event provided a space for students and police to get to know each other and build community on campus. Check out highlights from the event in the video below.